We apply the main idea from last time, iterative deletion of dominated strategies, to analyze an election where candidates can choose their policy positions. We then consider how good is this classic model as a description of the real political process, and how we might build on it to improve it. Toward the end of the class, we introduce a new idea to get us beyond iterative deletion. We think about our beliefs about what the other player is going to do, and then ask what is the best strategy for us to choose given those beliefs? Professor Ben Polak: Last time we talked a lot about the idea–I didn’t mention the name but here’s some jargon for you–we talked about the idea of deleting dominated strategies: looking at a game; figuring out which strategies are dominated; deleting them; looking at the game again; looking at which strategies are now dominated; deleting those; and so on and so forth. This process is called the “iterative deletion of dominated strategies.” This is not a great title for Barry’s book. You need to do better than that to get the two hundred and fifty dollars. This is a boring title, but never mind. Iterative Deletion of Dominated Strategies. The idea is–It embodies the idea of putting yourself in someone else’s shoes and trying to figure out what they’re going to do, and then think about them putting themselves in your shoes, figuring out what you’re going to do, and so on and so forth. Last time, we saw already, that this is a very powerful idea, in that game last time. But we also saw it’s a dangerous idea to take too literally: that sometimes this can get you to over-think the problem and actually, as in that numbers game last time, the best choice, the winning choice, might not involve so many rounds. We also saw in that numbers game last time that in some games, but by no means all games, in some games this process actually converges to a single choice. In that numbers game it converged to 1. So once again what this idea is–this idea is–you yourself should not play a dominated strategy. Delete those. Delete those for everyone else, because everyone else is not going to play a dominated strategy. Delete those. Look at the game with all those dominated strategies deleted. See if there are any strategies that are now dominated. Delete those. Look again, etc., etc. I could write that all up. We saw it in practice last time. It’s probably just easier to have the idea there. One tip about this, try to identify all the dominated strategies of all players before you delete, then delete. Then look again. Try to identify all the dominated strategies of all players again, and then delete. That process will prevent you from getting into trouble. So today, I want to be a little bit less abstract, if you like, and I want to look at an application. I want to look at a famous application from politics. So we’re going to look at a model of politics. The idea is going to be this. We’re going to imagine that there are two candidates, and what these candidates are doing is they’re choosing their political positions for an election. So you could think of these extreme left wing positions. These are people who, I guess, they don’t eat anything except for fruit and they think that trees should have the vote. These guys out here, these are the extreme right wing positions. So they think the poor shouldn’t have the vote and they eat immigrants. I’m an immigrant: better be careful. The candidates here are going to try and choose positions. We’re going to assume–this is not realistic–we’re going to assume for now that there are 10% of the voters at each of these positions. So there’s 10% of the voters at each position. So they are uniformly distributed. We’re going to assume that voters will eventually vote for the closest candidate. So voters vote for the closest candidate: the candidate whose position is closest to their own. And we’ll need a tiebreaking assumption and we’ll do the obvious tiebreak. If there’s a tie then the voters split. The voters of that position split evenly. If there’s a tie, half the voters at that position go for one of the candidates and half of them go for the other. So here’s a game, I’ve got the players, that’s the candidates. I’ve got the strategies, that’s the political positions. What am I missing? I’m missing payoffs, right? I’m missing payoffs. It matters in this game a lot how we specify the payoffs but we’re going to assume that the payoffs are that the candidates aim to maximize their share of the vote. But that’s not the only thing we could have assumed. We could have assumed that all they really care about is winning and that winning gave them a high payoff and that losing gave them nothing. I’m going to assume a little bit more and I’m going to assume that–I haven’t spelled maximized right, max will do–they want to max their share of the vote. The reason this isn’t a terrible assumption is you could think that getting a higher share of the vote gives you a mandate. Or, if this is a primary election, a larger share of the vote gives you a bigger push for the next primary or whatever. So we’ll assume that they’re trying to maximize their share of the vote. So we want to know what’s going to happen in this game. It seems like a pretty natural, pretty important game. Okay, so given what we’ve learned so far in the class, a natural first question to ask is: are any of the strategies here? There are ten strategies 1, 2, 3, 4, 5, 6, 7, 8, 9, 10, are any of the strategies dominated? Are any strategies dominated? Let’s get some–Let me get my microphones up and ready a little bit. So any strategies dominated? How about this gentleman in blue? So stand up and shout, yeah. Student: Okay, 1 and 10 are both dominated. Professor Ben Polak: So this gentleman whose name is? Professor Ben Polak: Steven says 1 and 10. We’ll come back to 10. You’re right. We’ll come back to 10. So he says that position 1, strategy 1, choosing the most extreme left wing position is a dominated strategy. What dominates it by the way? Steven, you want to shout it out? 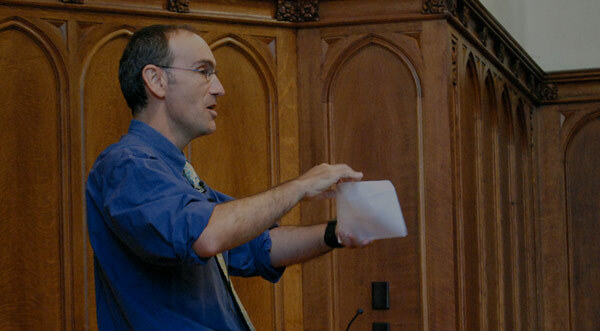 Professor Ben Polak: 2. So for example–So our conjecture here is that 2 dominates 1. That’s the claim. Let’s just be careful here, what does it mean to say that 2 dominates 1? It means that choosing position 2 always gives me a higher share of the vote than choosing position 1, no matter where the other candidate positions herself. It does not mean 2 beats 1. So let’s take Steven’s conjecture and see if it’s true. So, in particular, let’s start working out what share of the votes you’d get if you chose position 1 or position 2, against different positions the other guy can choose. So, for example, what we’re going to do is we’re going to test does 2 dominate 1? While we’re doing this we’ll figure out how these payoffs work as well. Well, how about versus 1. So suppose the other candidate has chosen position 1. So the other candidate has chosen position 1. Then we’re going to compare my payoff from choosing 1 against the other candidate’s payoff from choosing 1. We’re going to compare this with my payoff from choosing 2 against the other candidate choosing 1. Let’s figure out what that is. So what’s my–somebody can shout this out–what’s my share of the vote if I choose 1 and the other candidate chooses 1? 50%. That was pretty easy, right? It must be a tie for everybody, so I’ll get 50% of the vote. What’s my share of the vote if I choose 2 and the other candidate chooses 1? 90%. He will get or she will get all the voters at 1. I’ll get everyone else. So I get 90%. So in this case choosing 2 is better than choosing 1. But of course we’re not done yet. We have to consider other possible positions of my opponent. So suppose my opponent chooses 2. So now we’re comparing my choosing 1, when my opponent chooses 2, and the payoff I would get if I choose 2 when my opponent chooses 2. So what’s my payoff if I choose 1 and my opponent chooses 2? I get all the voters right on top of me at position 1 and she gets everyone else, is that right? So I get 10%. And what about if we both choose 2? 50%, everybody happy with that? So 50% in this case, and once again, 2 did better than 1. Everyone happy with that? So we showed this choice was better and this choice was better, and we’re going to keep on going. Against 3: so now we’re comparing my choosing 1 versus 3 and my choosing 2 versus 3. If I choose 1 against 3, what share of the vote do I get? I’m going to get all the people at position 1 and half the people at position 2 for a total of 15. And if I chose 2 against 3, what do I get? I get 20, I get all the people at 1 and I get all the people 2, so I get 20%, so we’re okay again. Let’s do one more just to see a pattern here. So if I choose 1 against 4, and comparing my choosing 2 against 4. In the former case if I choose 1 against 4, how many votes do I get? I get all the people at 1, and all the people at 2, so I get 20% of the votes, she gets everyone else. And here if I choose 2 against 4, I get all the people at 1, all the people at 2, and what? Half the people at 3, so that comes out as 25% and once again and so on. Now, I could go on right the way through here, but I’m going to stop because it gets to be a bit boring after a while. I’m guessing you can see a pattern emerging here. What’s the pattern here? What’s the pattern here? Somebody? Where’s that? Somebody raise their hand so we can get a micke out there. Can we get a mike on this guy in white? Stand up, stand up, yep, stand up and shout. Student: 2 is always better than 1. Professor Ben Polak: 2 is always better than 1, but we can see more than that in the pattern. That’s right, but what’s the pattern here? Mike back here. Student: Whatever’s closer to 5 is better than whatever’s farther away from 5. Professor Ben Polak: That’s not quite the pattern I’m looking for. Let’s look at the numbers here. We had 15, 20, then this one, up to 20, 25 and so on. So what’s the pattern here? Yes, Steven again. Student: If your opponent doesn’t choose 1 or 2, then you’re always going to be 5% better off if you choose 2 than 1. Professor Ben Polak: Exactly, so ignoring these first two positions which were a bit weird, choosing 2 always gave me 5% more votes than choosing 1, regardless of what the other person chooses. So I mean if you want, you can fill in the next–whatever it is–the next 6 positions and see. But you’ll see that very clearly that Steven’s right: that choosing 2 will always get me 5% more of the votes than choosing 1 from here on down. And in fact, they’ll go up in intervals of 5. So, in fact, it is true, it is in fact true, so we can conclude that 2 dominates–in fact, we can do a bit better than that–we can say strictly dominates 1. 2 strictly dominates 1. Is anything else dominated here, Steven already told us that 10 is dominated. I’m not going to go through that argument. Can everyone see that is symmetric? Hang on a second, everyone see that 10 is going to be dominated by 9 in exactly the same way? Is that obvious? It’s just really the same argument coming in the other direction. So similarly, 9 strictly dominates 10. And again, we’re not saying choosing 2 beats choosing 1, 2 wins against 1 or 9 wins against 10. Wwe’re saying choosing 2 always does better than choosing 1, regardless of what the other person chooses. Choosing 9 always is better than choosing 10 regardless of what the other person chooses. There was a question, are we okay? You want to get the mike in for the question? Stand and shout out to everyone. Student: I think you may have defined it already, but I couldn’t find a definition of strictly in the book we have. Professor Ben Polak: Okay, well you have one on the handout. I think there probably is one in there somewhere, but just in case, we have had two in class, there’s one on the handout. All right we’ve concluded that 1 is dominated by 2, and 10 is dominated by 9. Is anything else dominated here? Well what about thinking about whether 2 is dominated by 3, after all–I’ve forgotten your name–what’s your name there? Yes? Professor Ben Polak: Sudiptha had suggested earlier on, you want to be close to 5. So 3 is closer to 5 than 2. Is 2 dominated by 3? Anyone else? Any other hands? There’s a hand here. Can you get this lady here? Student: Once you delete the dominated strategies, then you kind of go through it again and then 2 is dominated by 3. Professor Ben Polak: Good, so you’re getting ahead of us, good. So we’ll get there, hold that thought. But what about right now before we delete anything? So let’s check it out. Let’s check it out. So, in particular, let’s just try this process. So how about my payoff versus 1, for example. So 2 against 1 gives me 90% of the votes, 3 against 1 gives me what? 85% of the votes which is actually lower, so it’s clear that 3 doesn’t dominate 2. In particular, if the other candidate were to choose position 1, I would get a higher share of the vote choosing 2 than I would have done if I had chosen 3. So, in fact, it’s not the case that 2 is dominated by 3. But the woman who’s name I either didn’t get or forgot. Professor Ben Polak: So Christine has pointed something out. So Christine, why don’t you wait for the mike and point that out again. So we know that 2 is not dominated, and particularly not dominated by 3, but … what’s the “but”? Student: When you delete the dominated strategy of 2 dominating 1, or 1 being dominated, when you delete that and 10, then it is. Professor Ben Polak: So what Christine is arguing is, even though it’s the case that 2 is not a dominated strategy, if we do the process of iterative deletion of dominated strategies and we delete the dominated strategies, then maybe we should look again and see if it’s dominated now. So let’s be careful here, we’re not saying that we’re going to delete the voters at 1, or delete the voters at 10 (though we might wish to). We’re just saying we want–What we’re saying is, we know that the candidates aren’t going to position themselves at 1 and aren’t going to position themselves at 10. So in some sense we’re deleting those strategies. The voters are still there. So let’s try that. So if we–there’s a but here I guess–if we delete the strategies 1 and 10, which were dominated, then does 3 dominate 2? Once again, we can try it out. So let’s try it out. So the payoff from choosing 1, let’s start against 2. So the payoff from choosing 2 against 2 is 50%. The payoff from choosing 3 against 2 is what? What’s the payoff from choosing 3? Someone can shout out. What’s the payoff from choosing 3 against 2? 80%: the person at 2 is going to get all the ones at 1, and all the ones at 2; and 3 will get everything else. So this is 80% versus 3. The payoff of 2 against 3 is all the people at 1, all the people at 2, so it’s 20%. The payoff from choosing 3 against 3, is of course 50%, so, so far so good. So far choosing 3 is better. Against 4, the payoff from choosing 2 against 4 is what? What’s the payoff from choosing 2 against 4? Again, all the people at 1, all the people at 2, and half the people at 3, so that’s 25%. The payoff from choosing 3 against 4 is going to be all the people at 1, all the people at 2, and all the people at 3, for a total of 30%, which again is bigger. Let’s do one more. Versus 5, the payoff from choosing 2–(I can afford to raise this a bit)–against 5, is all the people at 1, all the people at 2, and all the people at 3; 30%. Whereas the payoff from choosing 3 against 5 is all the people at 1, all the people at 2, all the people at 3 and half the people at 4, 35%. And again, you can see exactly the same pattern is going to emerge here. From here on down, if I bothered to do it, we’d find that choosing 3 always gets me 5% more of the vote than I would have had from choosing 2, against any of these higher numbers. The same pattern Steven pointed out before. So, I’ve forgotten your name again, I’m sorry. Professor Ben Polak: So Christine is correct in saying that once we delete the strategies 1 and 10–once we realize that those positions are not going to be chosen by our sophisticated candidates–then we realize that probably choosing 2 (and of course 9) isn’t a good idea either. So 2 and 9 are not dominated but they are dominated once we realize 1 and 10 won’t be played, or won’t be chosen. Okay, so where are we going here? Where are we going? Where is this discussion going to end up? Let’s come back to our original game. We’ve argued that 1 and 10 shouldn’t be chosen because they’re dominated. We’ve argued that once we realize those aren’t going to be played, that 2 and 9 aren’t going to be played. What’s going to end up being played? Well let’s just go slower. So we were able to dominate 1 and 10 in the first round, so we know this won’t be played, and we know this won’t be played. And remember the voters are still there: we’re just deleting the strategies. Then we dominated–Then we ruled out–(I’ll put double crosses for “in the second round”)–2 and 9. Then we ruled out 3 and 8, and then we ruled out, we would have done 4 and 7 and that leaves just 5 and 6. So if we do the procedure of iteratively deleting dominated strategies, going back again, looking what’s dominated, doing it again, doing it again … all that’s left is 5 and 6. So this procedure leads us to conclude that the candidates will choose positions 5 and 6. Does 5 dominate 6, or 6 dominate 5, or anything like that? No, at that point it’s just a tie, right? So in the end, the procedure, so iterative deletion–(let’s write “it del”)–leads to deleting all except 5 and 6. So this was just a simple exercise, I think. I mean I’m hoping that was a simple exercise. Let me just look out there, is everyone following that okay? That really wasn’t meant to be hard, but what’s relevant about this exercise is not the fact that it’s hard. In fact, it isn’t hard. What’s relevant is the fact that it’s relevant. It’s about the real world. In particular, this is a famous model in political science. Anyone know the name of this model? What’s the prediction here? The prediction here is that the candidates are going to be squeezed towards the middle. They’re going to choose positions very close to each other and very close to the center. What’s that called? Anyone know? Hold the thought on that. Someone at the back, shout out. This is the “Median Voter Theorem”; thank you. So let’s have a new board, this one will do fine. So the prediction is candidates crowd the center and this is called, in Political Science, the Median Voter Theorem. It’s called the Median Voter Theorem because the voters at the center, in this case 5 and 6, actually get to decide not just the election, but to decide therefore, what policies are put in place. How does this do as a prediction of the real world? Well there are examples in American History in which the Median Voter Theorem looks pretty good. They’re pretty old examples. They’re going to be before you guys were born, but let me mention them anyway. So I think a lot of people–if you go back today and you look at tapes of the Kennedy Nixon Election in 1960 (some American help me out here, ‘60 right? )–I think it was ‘60. So in the 1960’s actually, between Kennedy and Nixon, if you ever go over and look at those tapes, it’s amazing how conservative Kennedy looks when you think about his reputation today. They really were crowding the center. And eight years later Nixon seemed to have learned his lesson. If you look at the ‘68 election, which Nixon won, Nixon sounds, on those tapes of his policies being put forth in that election, he looks extremely liberal for a Republican. So again, they were crowding that center space. Some people argue that that’s exactly what Clinton did in ‘92. He took the Democratic Party to the right, i.e., towards the center in order to pick up those central voters and win. So there are examples in American History of elections that seem to–in which the Median Voter Theorem seems to do well. We’ll come back and discuss it more in a second, but before I do, let me mention that the same model, exactly the same idea, has an application in Economics. Somebody mentioned it already over there. The application in Economics is to do with product placement, something that Jake’s working on. In product placement, you might think when you’re placing a gas station, you might think it would be nice if gas stations spread themselves evenly out over the town or out over the road So wherever you happen to be, when you run out gas, there was a gas station close by. That would be convenient. But unfortunately, gas stations, as we all know, they tend to crowd into the same corners, they tend to be on the same road junctions, right? Why? Because they’re trying to, they’re competing for voters who happen to be close, or running out of gas at those moments, and by crowding together they avoid being out competed by each other in terms of position. I said that a bit quickly, but we’ll come back and look at that idea in more detail later on in the class. So in politics, this is about candidates crowding close together towards the center, to try and get as many voters who are close to them. And in Economics, this is about firm’s crowding together to try and get shoppers who are close to them. The people associated with this are a guy called Anthony Downs, who did this in Political Science, in a book in 1957. And in Economics, a guy called Hotelling, who wrote a paper about this in 1929. In Political Science, they call this “simultaneous discovery.” I think 1929 is a bit earlier, but never mind. Now, what I want to do now, what I want to is, periodically in the class and we have a model up there and we’ve got to analyze it. We’ve used a bit of Game Theory to analyze it. I want us to talk about whether we think it’s right. What do we think of the strengths and weaknesses of this model? So what I want you to start thinking about is: do you believe this model? Is this a good model of politics? What’s it missing? Let me come off the stage a second, so I can encourage you to get involved in the discussion. How many of you are Poly Sci majors? Raise your hands you Poly Sci majors. By the way, how many of you are Poly Sci majors who have seen this model before? Some of you have seen it before. So what’s this model missing? You all live in America. You all live in a democracy. You don’t all live in America, but a lot of you live in a democracy. Do you have some idea about this? So what are we missing here? So can we get the woman here Ale? Student: The voters are not evenly distributed 10%, 10%, 10%. Professor Ben Polak: So one thing that seems odd about the way we set up this model is that the voters are not evenly distributed. Let me go and put that up–it’ll be tiring but let me go to and fro a bit. So one thing that’s missing, or wrong if you like, but the one thing is the voters are not evenly distributed in the real world. Good, anything else? Good we’ll talk about each of these in turn. Can I get the guy over here? Sorry I’m not making this easy for Jude, let me just stay down here. I’ll collect a few and then go back to the board. Student: The model doesn’t take into account differences between the groups in voter turnout, based on the candidates. Professor Ben Polak: Good, so there’s an issue of turnout. We assumed here that everyone votes, is that right? But in fact, not everyone votes, there’s always the option of not voting. Remind me to put that one up, “not voting,” you’ll have to remind me of these. How about the gentleman here in the yellow. Student: There’s a difference between the primary and general election. Professor Ben Polak: Good, so we assumed, we kind of jumped to just one election and at least in the American system, for better or for worse–I could voice an opinion on that–there are lots of little elections on the way. There are primaries in all these states that you never, you probably have heard of, states you probably have heard of along the way. Anything else? Can we get the–Where’s the other mike? Can we get the woman in green here? Student: American voters often vote based on character rather than position. Professor Ben Polak: So there’s more than just positions. Another way of saying that, stop me if this is wrong, but one way to say that is we’ve been assuming that politics is one dimensional, left/right and there might be other things involved: character or even among issues, even among political issues it could be more than one dimension. It could be that there’s a dimension about the environment and a dimension about foreign policy, and maybe another dimension about redistributive politics. So that’s an important idea. Let me get a couple more, can we get? Student: The model might not apply with more than two candidates. Professor Ben Polak: So another issue here is, I just assumed that there were two candidates. We know in some elections there was third candidate. For example, there was Nader in the election in–well I guess he was there in the other one as well–but he was particularly there in 2000. So, by the way, I don’t mean this as a joke, in some sense there’s always a third candidate and that comes from the problem we had earlier, because not voting is always an option. So in principle, in that election in 2000, there was at least four candidates, as it were, four things you could do with your vote. You could vote for, as it was in that time, Gore, Bush, Nader, or not voting–and I’ll leave it to you to decide which of those is equivalent to not voting. Anyone else? One other thing I think that’s really, maybe it’s a small thing, there’s one other glaring thing here. Someone we haven’t had yet, Ale help me out here. Let me get this guy here. Student: Extrapolating from the fact that there are different things which people take into account, not everyone closest to 6 might actually vote for 6, it might be coincidence. So again, let’s think of an example here, a couple of examples, in the Bush Gore election, we saw President Bush, candidate Bush as was, saying “I’m not a right wing candidate, I’m a compassionate conservative.” And you guys believed him. I don’t know, maybe he was, I don’t know. His track record in Texas probably did actually look a lot like that. Or today, if you look at both primaries going on now, you’re seeing various candidates on both the Republican side and the Democratic side, seek to position themselves. But as you all know, those candidates almost all have track records, and not everybody believes that Clinton, that Hilary Clinton, is quite so centrist as she now seems. And not everyone believes that the former Governor of Massachusetts is quite so conservative as he now seems. So it’s not clear that you can just choose your position willy nilly. So let’s put some of these up. So I’m going to forget remember, so you’re going to have to help me out a bit. So we have many candidates, more than just two; or we have not voting, which is related to that actually; and we have choosing your position, the inability to commit to a position. So your position may be not believed, and I want to claim that that’s connected to the idea that you can’t commit yourself to your policies. We had some others. We had primaries; and we had other dimensions, so we had higher dimensions. Have I got the main ones now? I think I got most of the main ones. So there’s lots of things–when we look at this model–there’s lots of things that are missing. A lot of things are not seeming to be captured by it. And here’s where I want to get a little bit more religious, if you like. It’s tempting to say, look, we wrote up this model. It’s missing all this stuff, so it must be useless. You know we shouldn’t model it. You might even go further, you might say modeling it is always going to miss stuff out, so let’s just not bother. That, I think, is the wrong conclusion here. The right conclusion, I think, is: the reason we write down these models is to try and capture and test our intuitions. In this case, the intuition about crowding towards the center to get votes. But, of course, these models abstract from very important parts of reality, and the next step to do is what? Is to say, okay now let’s try to enrich the model, to add more into the model, and see if you get a different result, and if so why? So you start with your basic model, then you add in, you enrich the model, and you see if the results change, and that’ll help you explain why you’re getting different results in different settings. So the sort of religious part of today’s class is models are always abstractions. You want to use them to see what’s missing, and then add things back in, to see if they make a difference, and if so how. Let’s go through these a little bit. So it turns out that the very first one, voters are not evenly distributed is certainly true, it’s undoubtedly true. But it turns out that if you make the voters distributed more realistically, let’s say like on a bell-curve shape, it makes actually no difference to the result at all. So this is true, but it doesn’t actually change the result. So on this one we’re okay. The result survives this change. What about the one about many candidates? Well clearly that matters a lot. We know that there were many candidates in the ‘92 election and the 2000 election, and we know that “not voting” is important. So this one I’m going to let you see whether it makes a difference. This one’s going to be on the problem set. So I’m actually going to get you to do this. Let’s go back to the model, add in an extra candidate, and see what happens. You can learn whether it makes a difference. I’m not going to give it away. The one about committing to policy: this is important. It’s really hard for candidates to convince you, that they really are a left, or a right, or a centrist candidate. Let me give you a historical example outside of America, but in the real world, in England. In the ‘97–In the 80’s and 90’s, the Labor Party in England had lost election, after election, after election. And in each election, they would come forward and say, “we are not really a left wing party, we’re a centrist party these days” And people would say, we don’t believe you. So what Tony Blair, the guy who won the ‘97 election, did with “New Labor policy was: he managed to commit to a centrist policy by literally committing to it. He took the–In England you have to publish your economic and financial plans of the Government five years in ahead. So he took the financial plans of the conservative Government that was then in power, five years ahead, and he said these are my financial plans, I’m going to announce these today as my financial plans five years ahead. They’re exactly the same policies as the Conservative Government has. So not only was he choosing a position close to the Conservatives: he was choosing exactly their position. And it came down to what somebody else said here: that left the election on the other dimension, which might have been character or whatever. That won; that won by a big way. So nevertheless, even having given you that historical example, we’re going to come back and we’ll look later on in the class at a model in which politicians cannot choose their positions, but, rather, you know their positions ahead of time. So we’ll do this one. We’ll do this one later. These other two, primaries and higher dimensions, they’re both great points. We’re not going to have time to do them in this course, but if you take a class in the Political Science department on voting and on elections, on modeling elections, you will see that both of these have been modeled and discussed in great detail. There’s even some empirical work on just how high dimensions are really involved in elections. So this is great stuff for this area of Political Science. I want to inspire you to take some more advanced courses albeit in another department. So have I convinced you that there’s something you can do with iterative deletion? We used iterative deletion in a relatively abstract setting, or not abstract, rather a play setting last time in which were choosing numbers. And then we talked about it in terms of Hannibal invading Rome. And now we’ve seen how it applies here in an election game. I think that’s probably enough for iterative deletion. So what I want to do now is I want to switch course and introduce a new tool. This is what we’ll do typically in the class, we’ll have new tools. We’ll see how they apply. We’ll see what we can learn with them. And we’ll move onto a new tool. So I’m going to switch to a new tool. Any questions at this point? Everyone happy at this point? Happy is too strong–are people satisfied at this point? Okay, so we’re going to move away from this example and I’m going to introduce a new subject, and I’ll need several boards I think, so I might as well collect them. That little semi-religious speech about modeling, I think economists, those of you who are Economics majors you’re thinking, yeah, what’s the problem? For those of you who are History majors or Political Science majors, that’s more of an issue. So you really want to think about why we’re modeling, what do we get from this exercise? I want to move to a different approach now and a different approach to analyzing games is going to be about, what we’re going to call, best response. To kick this off, let’s look at an example. So here’s a game, a very simple game with two players. Player I is choosing Up, Middle, or Down. And Player II is choosing Left or Right, and the payoffs are as follows. They’re nothing very interesting. They’re just numbers thought up for the purpose: (4, 2) and (2, 3). So we’ve got (5, 1), (0, 2), (1, 3), (4, 1), (4, 2), and (2, 3). So, first of all, let’s try and analyze this game using the tools we’ve learned so far. So does either player have a dominated strategy? Any takers? So I claim that neither player has a dominated strategy, let’s just check. So, for example, you might think Down is dominated, but if we look a bit carefully we see that Down actually does better than Up against Right, and Down does better than Middle against Left. Similarly, we can see that Right is not dominated, because it does better against Up, than does Left. But Left isn’t dominated because it does better against Middle than does Right … so on and so forth. You can work through this game and you can check pretty quickly that nothing is dominated. So if the only tool I taught you in this class was dominated strategies and the iterative deletion of dominated strategies we’d be stuck. You wouldn’t be able to get started on this game. Nevertheless, it’s a pretty simple game, pretty straightforward game. Imagine you’re Player I in this game, what do you think you’d do? What would you do if you were Player I? Let’s have a show of hands actually. So let’s just see, look at it a bit. No abstentions. How many of you would choose Up? Raise your hand for Up. Raise your hands right now. Keep your hand down, you’re an SOM student. You can keep your hand up. Oh, your math was wrong, okay. You did accounting last year. No one’s choosing Up?No one’s choosing Up at all, okay. How about Middle? One person chose Middle. How about Down? Oh my goodness. Okay there’s a massive majority for Down. So let’s think about this a second. What if you knew that Player II was going to choose Left? What would you choose if you just happened to know that Player II was going to choose Left? Everyone agree because 5 is bigger than 1, and 5 is bigger than 4, so Up is–and to use a technical term we’ll define formally next time–Up is the best response to Left. Everyone agree with that? So Up, as I say, does best against left. Now what does best against Right? Middle does best against Right, after all, 4 is bigger than 0 and 4 is bigger than 2, so Middle does best against Right. So here’s an interesting thing. All of you chose Down, but Up does best against Left and Middle does best against Right. Let’s just push this a bit harder, suppose that you work for somebody. Some of you are going to go out of Yale and be your own boss, but most of you are going to, like me, are going to end up working for somebody. And suppose now this game came along in your line of work and you’d chosen up. Then your boss came to you, and looks rather fiercely at you–so this is Rick Levin or somebody–looking rather fiercely at me, and says “why did you choose Up?” What can I do? I can say: “oh I chose Up because I thought the other guy was going to choose Left.” I have a way of rationalizing choosing Up. I believe the other guy is going to choose Left, I can rationalize choosing Up. Is that right? Because that might save me from getting fired, at least for now. Similarly, if I had chosen Middle and President Levin comes along to me and says “why did you choose Middle?” I can say: “okay I chose Middle because I believed that the other guy was going to choose Right and Middle was the best thing for me to do against Right.” Once again, if I’m lucky I won’t get fired. It seems like I’ve managed to rationalize choosing middle. But Down, all of you chose Down. Pretty much all of you chose Down. Down is going to be a little trickier. How am I going to rationalize choosing down? Can I rationalize choosing Down? You all chose it. I’m your boss now. Why did you choose down? Somebody who hasn’t said anything yet. Can I get the mikes up and perhaps the person right in front of you. Stand up and shout. Student: It’s the safer answer if you can’t decide whether or not your opponent’s going to choose Left or Right, so you don’t have to worry about having a payoff of 0. Professor Ben Polak: All right, so in some sense it’s safer, it avoids the 0, although–I mean it’s true it avoids the 0–but it also doesn’t get the 5 and the 4. But I think the key part of your answer was I might not know. I might not be sure whether the opponent, whether my opponent, is choosing Left or Right. For example, I might believe that it’s equally likely that they choose Left and Right, is that right? So let’s look at something. Let’s look at my payoffs from choosing these three options Up, Middle, and Down, if I think it’s equally likely that my opponent will choose Left and Right. So what we’re going to look at is the expected payoff of Up versus, let me call it a (½, ½): a (½, ½) being equally likely that my opponent chooses Left and Right. So what’s my expected payoff from choosing Up where I believe the other person’s going to choose Left and Right, equally likely? It’s what? It’s a ½ times 5 plus ½ times 0 for a total of 2.5. Is that right? What about my expected payoff from choosing Middle against (½, ½), so in this case where I think it’s equally likely that my opponents going to choose Left or Right? So in this case, my expected payoff is a ½ of 1 plus a ½ of 4, for a total of again 2.5. Everyone happy with that? Is my math correct so far? How about my expected payoff from choosing down versus (½, ½)? This is going to equal a ½ of 4 plus a ½ of 2, which is a ½ of 6, so that’s 3. So it turns out that, as the gentleman out there said, if I thought it was equally likely that my opponent was going to choose Left or Right, then actually my best choice, my best response is to choose Down. Not only is it a good compromise., Not only is it safe. It’s actually the best I can do. It maximizes my expected payoff. Now we’re not quite there yet. We know that Up does best against Left. We know that Middle does best against Right. And we know that Down does best if I think it was equally likely that the person was going to choose Left and Right. But that’s not the only beliefs I could have. For example, I could believe that it’s twice as likely that the person’s going to choose Left as Right. It could be, they’re twice as likely to choose Left as Right. So equally likely was probabilities of ½ and ½. What probabilities are associated with thinking it’s twice as likely they’re going to choose Left than Right? What probabilities are associated with that: (2/3, 1/3). If I thought there was 2/3 probability they’d choose Left and 1/3 probability they’d choose Right, then I think it’s twice as likely they’re going to choose Left, and I could redo this calculation. And in principle, I could redo this calculation for every single possible probability you could think of. But that would get very boring, so rather than do that, let’s draw a picture. What I want to do is I want to draw a picture here, in which on the horizontal axis, I’m going to put the probability of the other guy choosing Right. It’s my belief that the other guy’s going to choose Right. Think of this as a belief. On the vertical axis–I’ll put two vertical axes in, just for the sake of things–on the vertical axis I’ll put my expected payoffs. And let’s start by considering my payoffs on this picture, just to help myself a bit, let me put some points in here. So I’ve got 1, 2, 3, 4, 5. You should probably do the same in your notes. You probably have lined paper, that makes this easier. Let’s start by plotting my expected payoff from choosing the strategy Up. So this isn’t so hard, we know that if I choose Up and there’s probability 0 that the other guy is going to choose Right, that’s the same as saying I choose Up and the other guy chooses, let’s try it again. If this probability is 0 that the other guy chooses Right, that’s the same as saying that the other guy is going to choose Left. So the probability is 0 of the other guy choosing Left is, the same as, let’s try it again. Probability is 0 of their choosing Right is the same as saying they choose Left, so that my payoff from Up against that is given by the top box up there, I get 5. So this is my payoff from choosing Up against Left. Conversely, if there was probability 1 that the other guy is going to choose Right, and I choose Up, then I get 0. So this point here corresponds to my payoff if I choose Up and they choose Right. And we already know if I look at the probability of a ½, which is here, that the payoff I get from choosing, the expected payoff I get from choosing up against a (½, ½) is 2.5. So here’s a third point we can use. What is this graph going to look like other than these three points? What’s it going to look like other than these three points? It’s going to be a straight line. So, you can confirm that for yourself at home, but in fact, if I draw a straight line, this will actually be correct. So what is this? This is my expected payoff from choosing Up against the probability of the other person choosing Right, and what is it actually equal to, just to confirm the equation, it’s: (1 minus the probability that they choose Right), in that case I’ll get a payoff of 5 plus (probability that they choose Right), in which case I get a payoff of 0. So it doesn’t really matter, but that’s actually the equation of that line. What about choosing Middle? Well once again, we can plot that point So if the other person’s choosing Right with probability 0, that’s the same as saying they’re going to choose Left, and if I chose Middle against Left, I get what? I get 1, I should use this pointer. So that’s here, and if I knew they were choosing Right for sure, that’s the probability of 1 that they’re choosing Right, and if I choose Middle I get 4, that’s here. And we’ve already agreed that if I think it’s equally likely they’re going to choose right and left, that there’s a probability ½ of them choosing right I get 2.5 from choosing Middle. So putting that all together, I know that it must go through here again, and once again, I get a straight line. I think I might have missed slightly but it’s more or less right. So what is this? This is the payoff to Player I of choosing Middle against Left. This is the payoff to Player I of choosing Middle against Right, and the line in between, this line here, is the expected payoff to Player I of choosing Middle as a function of the probability that other people choose Right. Now again, we could write down the equation. it’s going to be: (1 minus the probability they’ll choose Right) times 1, plus (the probability that they choose Right) times 4. Again, don’t worry too much about the equation, we’re not really going to do any math here, I’m just putting it in for completeness. Everyone following me so far? So let’s put in now, the third of these lines. I really should have used a different color already. Let me switch colors. Let’s put the line that corresponds to choosing Down. So that third line, not to belabor the point, is going to go through here, through 4 and through 2, so this is the payoff from choosing Down against Left, and this is the payoff from choosing Down against Right, and I got those from looking at these payoffs here and here. In between, once again, it’s a straight line. So here’s the straight line, and this line is the expected payoff to Player I from choosing Down as it depends on the probability that the other person chooses Right, and then once again, we can write down the equation. It’s (1 minus PR) times 4, plus PR times 2. I claim that this picture really tells me everything I could possibly want to know when my boss comes along. When President Levin or Barry Nalebuff who is now walking to the back of the room, when my boss comes along and asks me why did you do that? Why did you do that? I can now say. So, for example–let’s put in these crossing points here, for example–what I can say is, if I think it’s very likely –let’s call this point X–if I think that the probability that the other person’s going to choose Right, is less than X, then the highest payoff I can get corresponds to this line. That’s the highest line and that line corresponds to me choosing Up. If I think the probability that they’re going to choose Right is less than X, then my best response is to choose Up. Conversely, if I think it’s more likely than this crossing point Y–I think it’s very likely they’re going to choose Right. It’s more likely than Y–the probability that they’re going to choose Right is more than Y, then the highest line of these three is this one, which corresponds to my choosing Middle. So over here, my best response is to choose Middle. Let’s put that in. So over here my best response is Middle and over here my best response is Up, and in between it’s going to turn out that the highest lines, if my belief that the person’s going to choose right is more than X and less than Y, then my highest expected payoff comes from that blue line, and in that case my best response is Down. I can rationalize all three of these decisions and hope that Barry won’t fire me. Now we can do more than that if we’re being nerdy, but I’m not going to be this nerdy today. What we can actually do is we could solve out for the X and for the Y. How would we go about, I mean I don’t want to do it because I’ll probably get it wrong, but if I wanted to solve out for this X and the Y, since this is a QR class, let’s just talk about it a second. How would I do it? Somebody who’s not a math major, tell me how I solve out for the–maybe the math majors can’t do it actually, it’s too simple. Somebody who is a math major, tell me how to solve out for the X and the Y. Let’s get a mike on this person here. Student: Set the intersection points equal, the equations equal to each other and solve. Professor Ben Polak: Good, good to define–to solve out for X: X is when this blue line equals, sorry, this blue line equals this red line. So what we’re going to do is take the equations for those two lines, so here’s one of those equations and here’s the other one, set the P in those equations equal to X, I’ve got two equations in one unknown, I’m sorry, I’ve got one equation and one unknown. I’ve set these two things equal to each other: I’ve got one equation and one unknown. So I can solve out for X. I think I did that at home. If you do that at home I think, but don’t trust me, you’ll find out that X is equal to a third. Now, just to repeat, again I know I’ve got some math phobics in the audience, let me just slow down a second, all I’m doing here is I’m saying look at this equation of the pink line, look at this equation of the blue line, X is when they cross, i.e., they are equal to each other. Take these two equations, put an equal sign between them, replace this PR throughout with X, I’m going to have one equation and one unknown and that even the math phobics in the audience did in high school. Is that right? Now we’re going to–I’m going a bit slow here–but I’m going to use this method next time to introduce you to the most important class, sorry, the most important game we’re going to see in the whole course. In fact, it’s the most important game in the world. What is the most important game in the world? Don’t go yet. What’s the most important game in the world? We’re going to use this idea of best response. We’re going to think about it, and we’re going to learn from it in the most important game in the world. What is the most important game in the world? Football: soccer actually. Soccer is the most important game. So we’re going to show how this technique is going to help us shoot penalty shots in soccer. Before you go, that’s Barry Nalebuff at the back, he has copies of the book, it’s a great book, go buy it from him.